ABOUT MAJXSTY… Kimberly Williams (also known as Majxsty) has a heart that beats for the homeless, the hungry, and the hurting./nMajxsty’s soul-stirring lyrics have the ability to reach people right where they are (lost and saved alike)…because she has walked through dark periods in her own life. It has been because of her faith in Jesus Christ that she has survived – and developed a music ministry designed to encourage others./nMuch of Majxsty’s music, including her second album Come Closer, has been inspired by the Bible. 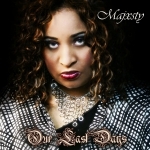 “I want my music to be known for using Scriptures to minister to all who hear it,” she said./nAlthough she didn’t get saved until she was age 26, Majxsty has always had a “love of music burning in her heart.” She started rapping/writing at the age 8. Not only does Kimberly have the ability to write song lyrics (everything from Rap, Gospel, R&B, Ballads, Pop, and Gospel Rap), she has the ability to perform the raps she writes. She has done so in many states, including opening for comedian Arnez J at a comedy show in New York. She has written for and performed with artists while living in Germany./nIt’s not every day that you meet a wife and mother who is a Christian rapper and hip-hop artist, but that’s exactly who Majxsty is. Born in Ft Lauderdale, Florida, Majxsty and her husband now reside in Clarksville, Tennessee, with their two children. She is currently seeking an M.A. in Christian Counseling, as well as an A.A. in Business Management. Her hope is to “counsel the mind and the heart” as she draws people closer to Christ…through her practice and her music.